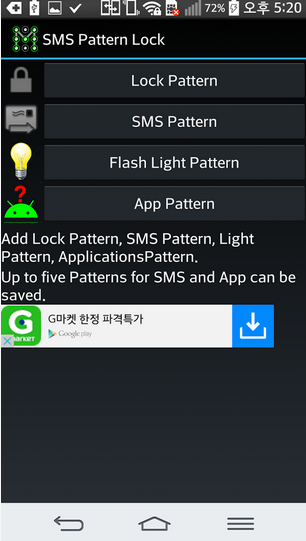 Sms Pattern lock app for android is one the most downloaded android apk app with the application of which you can set screen lock as sms security lock to your android apk phone.In addition to screen lock and sms lock,Sms Pattern Lock contains flash light pattern lock feature which will switch on flash light on justifying the correct lock pattern.In sms pattern lock,you can set screen lock & sms lock pattern for enhancing the security of your android apk phone.Another feature added is that if you want to send sms to someone so you can place the name of recipient with the sms body detail and then you will apply the pattern lock on that sms. 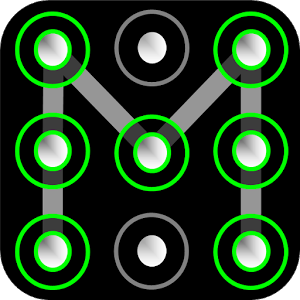 When you want to send that sms to the recipient,then you will have to unlock that locked pattern.On unlocking the lock pattern,the sms will be sent to the recipient. First run the sms pattern lock app.Then go to Menu option. 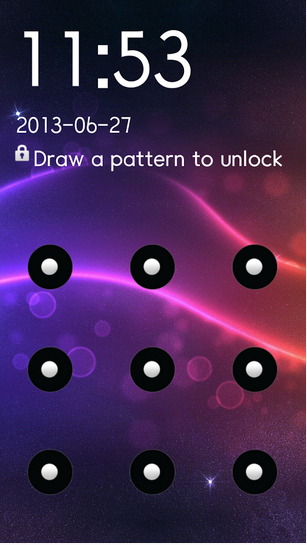 For locking the screen, go to menu option>>Add pattern>>Lock Pattern. 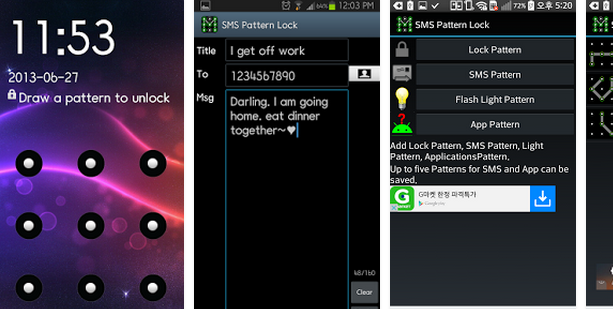 Run Sms Pattern Lock>>Menu>>Add pattern>>SMS Pattern>>Add all the detail of recipient>>Now draw your pattern. Now for starting the sms pattern lock sevice,Touch check Box at the top right corner.Now turn on the screen and then set pattern of your choice whether you want to turn flash light on or want to send sms or want to unlock screen.You will have to apply pattern of that specific category which you had set at configuration time. Setting lock of home screen. Can set sms to any recipient on unlocking the pattern. 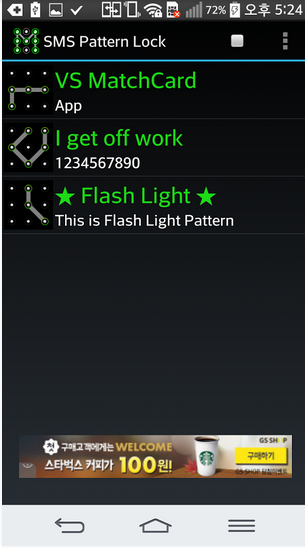 Can turn on the flash light on unlocking the pattern. 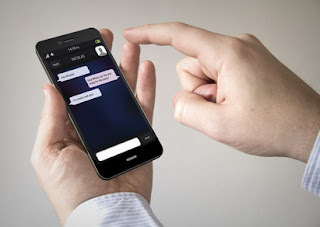 Can send sms and turn on flash light without unlocking the screen.